On the first day, we had to measure 30cm of copper wire out. After we had obtained the piece of copper wire, we had to wrap it around a pencil to make a coil. The coil should be able to go from the bottom of a test tube to the top of the same test tube. The top of the coil should be uncoiled so you can have a “handle” to grab onto later. When we had the copper wire into a convenient spiral, we weighed it. The weight of our copper coil was 3.642 grams. Then, we placed the copper spiral into a test tube and moved on. Next we had to weigh out a little weighing dish and tare it out of our next measurement which was a gram of silver nitrate. When we were done weighing everything out, we put it all inside of the test tube. Of course we did this carefully to ensure that we didn’t lose any of the contents. Then, we poured distilled water into the test tube until the water was about 2cm from the top. When we were done adding the water, we covered the top of the test tube with parafilm to make sure nothing got out of it when we shook it. After we thought the parafilm was around our test tube enough times, we placed our thumb across the top and shook it until all of the silver nitrate was dissolved. Finally, we set the test tube aside for the day and completed questions 6-9 on our worksheet that will be at the end of this post. To start out you take a piece of filter paper and weigh it. Our piece weighed 1.535 grams. Then, you shake the test tube to dislodge the silver from the copper wire. After this was done, we set up a funnel with our filter paper inside of it. Then, we pulled the copper wire out of the test tube and placed it on an undisturbed paper fowl off to the side.With a waste beaker beneath the funnel, we poured the rest of the contents in the test tube into the filter paper. Using a water bottle, we rinsed the test tube out several times to wash the silver out of it. Finally, allow both of them to dry overnight. On the final day, you weigh the copper coil and record its mass which was 3.355 grams. Then weigh the silver nitrate with the filter paper and record its mass which was 2.464 grams. Then, you finish the rest of the questions on the worksheet. 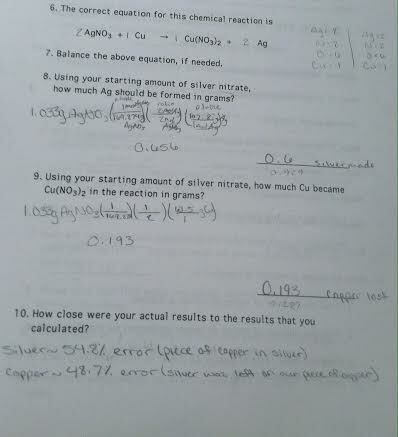 Our percent error was so high because I dropped a piece of copper wire into the bottom of the silver nitrate and there was some silver on the copper wire still.